The Miloco Studios group is run by a small, specialist studio team from our base in London. We can find the most suitable studio for your project, however large, small, diverse or complicated. Miloco work in partnership with some of the biggest producers and studios in the world, but if you are just starting out we can help you make the right choice for your recording project. All the studios on our site, in the UK and throughout the world, have been handpicked by us, so we are sure we can help you. Search the Miloco site to find your perfect recording studio, or call or email our bookings team for advice on the best options for your needs anywhere in the world: email bookings@miloco.co.uk or call +44 (0) 207 232 0008. Search through the London recording studios and find what you need. 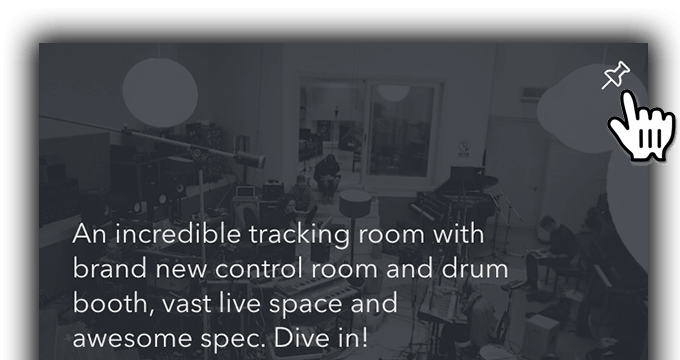 Writing studios, tracking rooms and more. We represent studios all around the UK including some great residential retreats. Find your perfect studio anywhere in Europe. We represent studios in France, Germany, Italy and further afield. Miloco has spread its wings across the Atlantic and is now representing some great USA recording studios. Check out our worldwide directory and view all the studios in our worldwide directory. Select a group of studios and email the selection to your friends or colleagues. Click on the pins on the studio cards to choose and then head to 'pinned studios' on the navigation bar to email your selection.